Black and white murano glass pendant necklace by Farfallina. 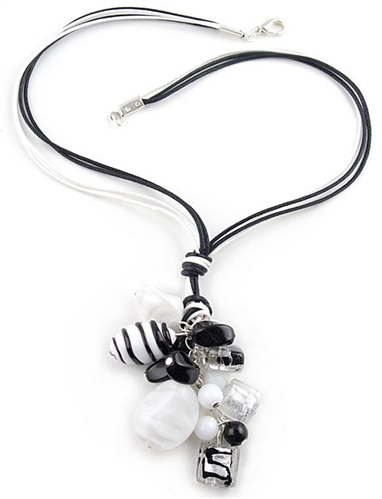 Necklace features different styles of playful black, white, and silver-leaf beads. This Venetian drop pendant is hand-made in blowed Murano Glass and hangs by four intertwined black and white cords. Necklace measures 44.5cm in length and is available exclusively in the UK at Farfallina.net. Necklace also makes a perfect gift idea. Length: 44.5 cm / 17.5 "
Pendant measures: 6.2 / 2.4"
Designer: Un jour for Farfallina.